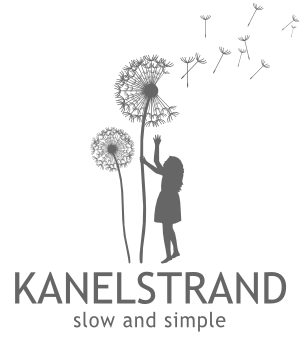 Kanelstrand: A Portrait of The Artist: Do You Like My Hat? A Portrait of The Artist: Do You Like My Hat? Do you remember those cozy moments with your parents, at the time when you were so young that they seemed to be almighty, all-good and all-knowing? You felt safe just because they were near, and you laughed at their jokes which they painstakingly invented with the only purpose to make you happy. The perfect equilibrium! "The question, “Do you like my hat?” comes from the P. D. Eastman book Go, Dog, Go! My father was an educator, a very funny and often silly man. He loved the exchange in this book between the male dog and the female dog. She tried every hat under the sun trying to impress her man to no avail until the very end. When my dad wanted to make us laugh, he would take whatever was at hand - a book, a pot, a toy, put it on his head and say, “do you like my hat?” It was his trademark and I have made it mine as a tribute to him." Now, you wouldn't expect anything less than perfection from Laurie, would you? And I promise, she won't disappoint you. Her hand-knit scarves, cowls and accessories have the warmth and softness of a childhood memory because she uses only natural yarns, just as her mother taught her. There is no higher sustainability than craft and love being passed on to the next generation! I know how curious you are already to know more about her, so please meet Laurie and if you still haven't, click here for a chance to win one of her unique scarves! When did you learn to knit and how did you decide to turn your skill into a business? This could be a very long answer! I officially learned to knit around the age of six, but I only knit off and on until my mid-thirties. Having children motivated me to learn to knit, to have things to pass on to them. 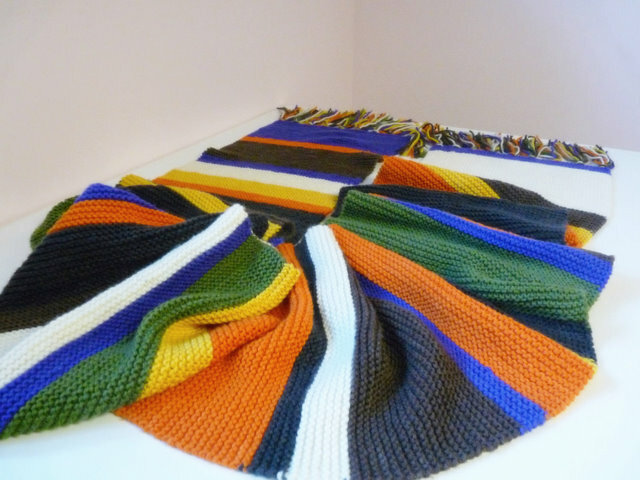 My mother was an absolutely extraordinary knitter, a master knitter we would call her today. Tragically she developed Alzheimer’s disease and one of the first things it robbed her of was the ability to knit. It was then, about ten years ago, that I really became a knitter, to carry on for her. What are your favorite materials to use and why? When I first started knitting, I was really concentrating on the technique, learning to manipulate the needles, to read patterns. I hadn’t yet contacted with the wool, if you will. When we reach a certain ease in the skill of knitting, there seems to be a little magic going on. We stop thinking so much and start feeling and seeing the yarn. That was how I slowly began to understand the differences between the fibers I was using. I love soft, silky yarns, merino, cashmere, alpaca. 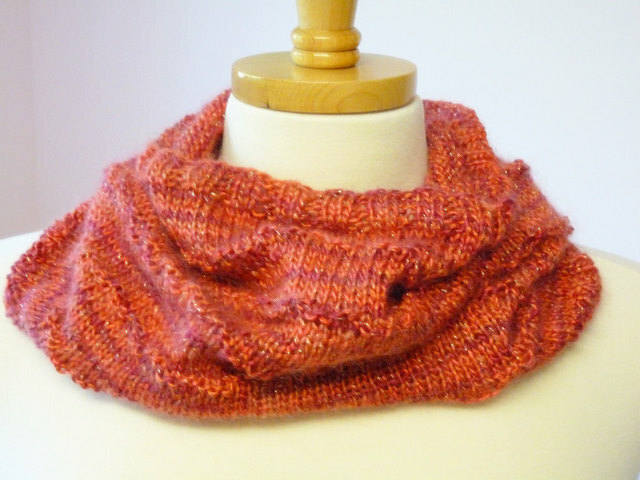 They are easy to knit with, easy on the needles and easy on the hands and they make beautiful finished projects. I am also particularly fond of variegated (multi-color) yarns. In what way are your works eco-firendly? How do you choose your yarns? I, as most teachers, I imagine, was drawn to teaching by the love of books and learning. I have learned so much about fiber in the last few years (and have only begun to scratch the surface!) that my whole outlook towards fibers has changed. I only use natural fibers in my projects. Natural fibers provide better insulation from the heat and the cold and water and snow than any synthetic fiber (we forget that this is the purpose of the animal’s coat!) Clothing made from these fibers is very long lasting and 100% recyclable and biodegradable. The United Nations declared the year 2009 the International Year of Natural Fibers because of the important role the development of these fibers play for producers, consumers and the environment. These are the kinds of information that I hope to share on my blog. I try to buy from smaller producers because they use methods that are better for the animals and the environment and I support companies who are helping women in emerging countries gain independence, like Manos in Uruguay, Be Sweet in South Africa and Lantern Moon in Vietnam. One thing I like about knitting is that I can always start over. How do you deal with crafty mistakes? Do you see them as such? In the beginning, starting over is very frustrating, but we learn so much about knitting in the process. Elizabeth Zimmermann, the person who has taught me the most about knitting, called mistakes “design elements”, i.e. not to worry too much about them and perhaps you will have created a new technique that you will like. She also said though that if it’s a big mistake, it’s better to go back and fix it because it will always bother you in the finished garment. I really agree with her on both accounts! In your etsy profile you say you teach psychology, how does this affect your creativity? In psychology we are primarily interested in understanding human behavior, what makes people “tick”. In order to do this well, we have to be excellent observers. I think that is the most important connection I can make between the two. I spend a lot of time listening and looking at the people and the things around me and many different ideas for designs, colors and projects end up in my precious notebook! Where do you see yourself creatively in 5 years? The answer to this question terrifies my husband! I would love to be able to retire from teaching in 7 years (I will be 55 and will have been teaching for 32 years!) to devote myself to fiber arts and blogging and even raising animals and spinning yarn! Who knows? A year ago, I didn’t even know this fabulous Internet world of crafters existed so I think anything is possible! What is your current favorite item by another etsy seller? I would like to mention two of my favorite shops. When I talk to people who don’t shop much online about my Etsy shop they tend to think that it must be very impersonal. What I have found is that it is not much different than shopping in person. There are lovely people online and others that are less so. But, I did not expect to meet such extraordinary people. I have to mention Jennifer of The Bracelet Tree. Jennifer makes gorgeous jewlery and the most artistic treasuries that I have seen on Etsy and she is simply a wonderful person. We “met” shortly after my arrival and she gave me all kinds of precious advice to help me navigate in the Etsy world. The second is Mindie who has two Etsy shops - Mindielee and MindieleeSupplyz - which provide me with endless inspiration. She is also a fabulous person. Now that I have more experience on Etsy (a whole six months!) I realise that even though we are not interacting face to face, the relationships we establish matter as much as the quality of our products. You can read more editions of A Portrait of The Artist here. Interesting interview. I love the story of the inspiration for her shop name. And her knitted work is wonderful. Great story of the shop name. My dad inspires me. Thank you both FabicFascination and Erika for your lovely comments! If you read Sonya's blog then you know that she is an extraordinary person. We can see it in her photos and hear it in her words. I sponsored Sonya's blog because I believe in what she stands for (and for the publicity of course! ), but I never expected all this attention! The hours Sonya has put into the giveaway and the promotion are amazing! So, thank you Sonya from the bottom of my heart! What an excellent interview! I love how Laurie honors her parents! The perfect name for her shop! It was great to learn more about Laurie and the yarn she uses. Laurie, I hope you get to follow your dream in retirement! Great interview! I love the name of her shop and the story behind it. Her items are colorful and beautiful. It's wonderful to learn more about Laurie! Her work is just gorgeous and she is a delight as well! It's so generous of her to offer this giveaway. Very few people are able to convey a real sense of warmth and love online, but Laurie does exactly that. The "Green, teal, brown and beige superwash merino cowl" is amazing. I've always wished I had time to get back into knitting. Ooh, I love the colors! I loved Go Dog Go when I was a kid! Do You Like My Hat is a great name for a shop, but I wouldn't have caught the reference. so nice to meet you ..i am in awe of your work!! Interesting interview!! And I love that book...I love reading that to the kids at work...it's an easy book to get them involved in. 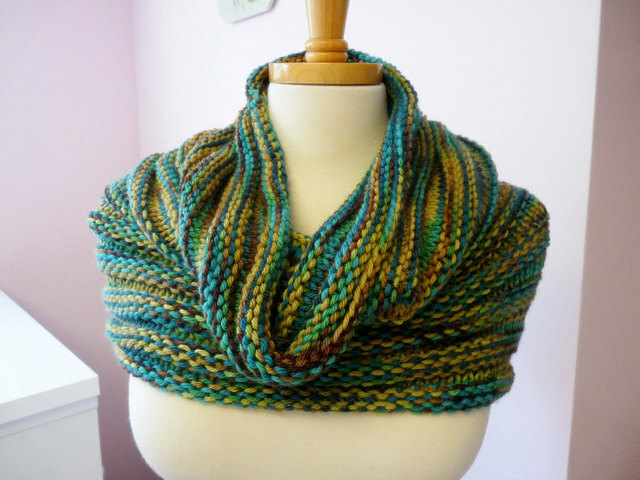 Her teal and brown cowl is gorgeous! !